Spread each of 16 cookies with 1 Tbsp. cream cheese mixture. 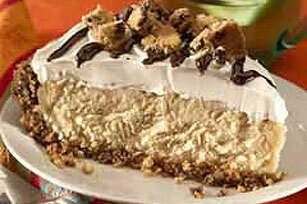 Place 8 topped cookies on parchment-covered baking sheet; top with remaining topped cookies, cream cheese sides up. Cover with remaining cookies. Refrigerate 10 min. Place frosting in microwaveable bowl. Microwave on HIGH 20 sec. 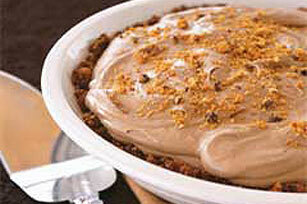 or until frosting is softened to pourable consistency, stirring every 10 sec. Stir in a few drops food coloring until desired color. 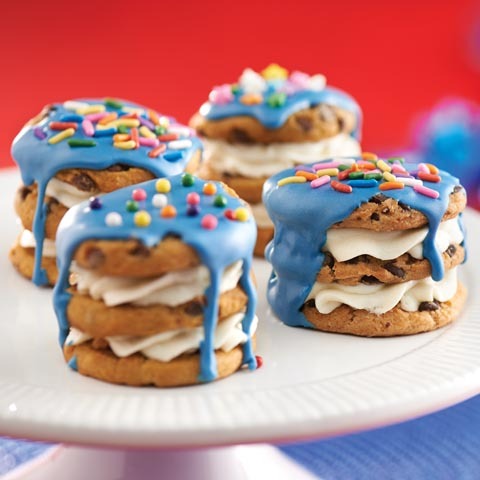 Spoon frosting over cookie stacks, using about 2 Tbsp. for each. Refrigerate until ready to serve. Jazz it Up!Garnish desserts with drained maraschino cherries or multi-colored sprinkles before serving. Alternate PreparationSpoon cream cheese mixture into a pastry bag fitted with a star tip; use to pipe cream cheese mixture onto cookies as directed. Size WiseBalance out your food choices throughout the day so you can enjoy this dessert.